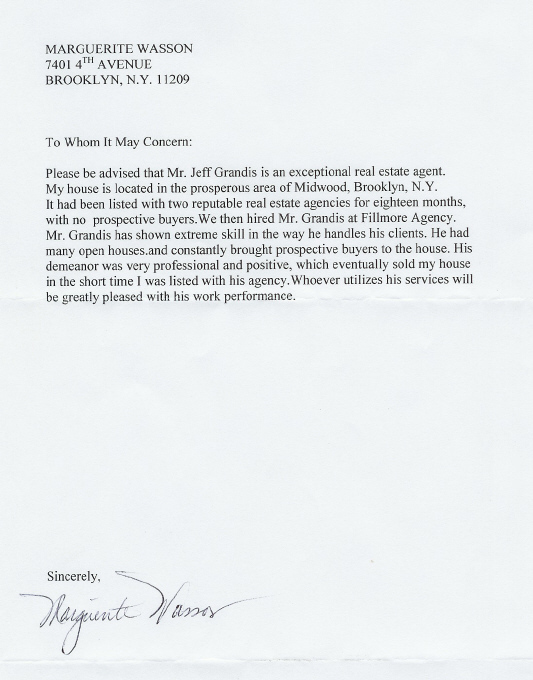 Please be advised that Mr. Jeff Grandis is an exceptional real estate agent. My house is located in the prosperous area of Midwood, Brooklyn, N.Y. It had been listed with two reputable real estate agencies for eighteen months, with no prospective buyers.We then hired Mr. Grandis at Fillmore Agency. Mr. Grandis has shown extreme skill in the way he handles his clients. He had many open houses.and constantly brought prospective buyers to the house. His demeanor was very professional and positive, which eventually sold my house in the short time I was listed with his agency.Whoever utilizes his services will be greatly pleased with his work performance.